The #1 reason for lawnmowers and snowthrowers to be hard-to-start or run rough is the use of old or poor gasoline. The problems only get worse with power equipment that is used infrequently or as is often the case with a snowthrower, inactivity for more than 6 months! 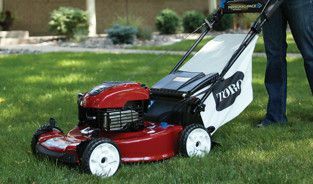 By following our recommendations below, you will guarantee yourself a mower or snowthrower that is easier-to-start and smoother running. 1) Never use gasoline that is older than 1 month. This may sound simple, but do keep in mind that it is important for the gasoline that is inside your equipment to be less than one month old as well. When gasoline sits around, whether that be in a gas can or the tank of your mower, it is degrading and often absorbing moisture from the air. As this happens, the small amounts of gasoline that the carburetor is sending over to the engine are not as rich as they once were, and will not produce the type of response your equipment needs. If you have straight gasoline that is older than one month, we recommend you pour this gas into your car whenever your car’s tank is at least half full. It will mix with the rest that is inside and your car will not miss a beat. If the old gasoline you have is a oil/gas mix of some sort, you are likely to have fewer of these problems because most of your 2-cycle oils now have some fuel stabilizers in them. 2) Use fuel stabilizer whenever possible. We recommend the use of Briggs and Stratton’s Advanced Formula Fuel. This is a treatment and stabilizer for all gasoline engines (4-cycle and 2-cycle). It protects engines from problems caused by ethanol, which is found in most gasoline purchased at the pump. Use of this additive stabilizes fuel up to 3 years! For more information about Advanced Formula Fuel, please view our product listing. 3) Purchase gasoline with less than 10% ethanol by volume from a name brand fuel producer. Every gas station will have stickers on their pumps in reference to the amount of ethanol that is in their gasoline, be sure that these read 10% ethanol or less. Ethanol will cause wear and tear on engine parts and promote the absorption of water, so the less of it that is in your gasoline the better. Because the small engines that are found on your lawnmower or snowthrower do not have as good of seals as those found on your car, the longer gasoline sits around in this equipment, the more moisture it collects and the harder it becomes to start the engine. Most of your engines built for small power equipment (new and old) are not designed to hold up to extended contact with the ethanol in gasoline. Because ethanol is a solvent and a drying agent, rubber and plastic components inside your engine will often breakdown or dissolve and no longer perform the way they were intended. With so many problems related to ethanol fuel, you can now purchase canned fuel that contain NO ethanol, such as TRUFuel (stocked in our Lawn and Garden Department year-round). 4) Drain engine and carburetor of gasoline at season’s end. Because of all of the factors I have mentioned already, it is very important that you take this one additional step before storing your lawnmower or snowthrower for the season. If you can not find the drain plug for your carburetor or gas tank, you can also run the engine “dry”. By doing so, you will eliminate the contact of gasoline on critical engine parts and reduce the risk of corrosion over a time of inactivity. By practicing these good habits, you will improve the life and performance of your outdoor power equipment.